Custom made mosquito curtains are a great way to add privacy, ambiance, and beauty to your porch (and keep the bugs out) at a reasonable cost. As Kurt Jordan the Founder of MosquitoCurtains.com writes "... mosquito netting curtains are for the "porch that is too beautiful to screen". We believe it's a very affordable and elegant way to create a porch enclosure. These curtains appeal to just about everyone. More affluent homeowners appreciate their beauty whereas others benefit from the attractive cost. But the best part? 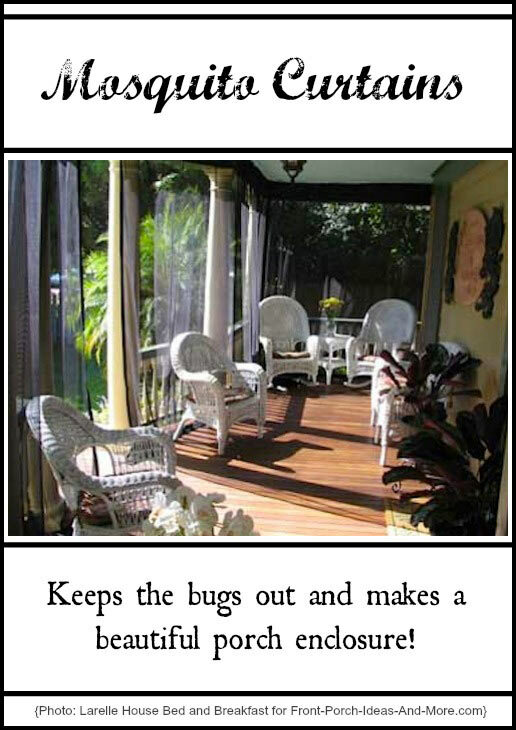 Everyone appreciates being able to enjoy their porch throughout the entire season without being bothered by bugs. The netting is durable and made from heat-cured polyester; it is machine washable and comes in three neutrals: white, ivory and black. Because the curtains are easily cleaned, a white color reflects radiant sunlight. For areas with no-see-um's, you may want jet-black fabric. Another great feature of this mosquito netting fabric is the attachment options. You can either use Velcro® tape for a semi-permanent installation or a track system that allows you the option of opening the curtains when not needed. 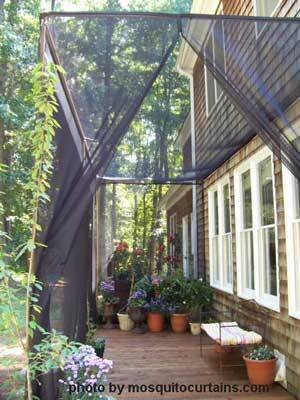 These curtains for great for under deck spaces, however, "What if I have a deck, but I don't have a roof?" The alternative is to purchase an awning, buy a pergola kit from a home improvement store or make your own solution using painted pipe. John, a site visitor asks us about stopping no-see-ums and mosquitos. See our reply.